BlytheLife.com » Interview with Jess from MilkyRobot.com! I was really excited when Jess came back into the Blythe community after a (short!) hiatus from dolls. Her customs are beautifully done and I really enjoy looking at her work on Flickr! Not only does Jess customize dolls, she also does reroots and makes clothes for dolls as well. Making things from pretty dolls to lovely dresses and cardigans, Jess has no doubt made a name for herself in the Blythe community and I had the honour of interviewing her for BlytheLife.com! You can find more of Jess’ work at MilkyRobot.com, at her Etsy shop and on her Flickr! Hi Jess! What can you tell us about yourself and how you got into the Blythe hobby? I discovered Blythe in January 2009 when my daughter was born. I was on maternity leave and got so bored while the little one napped, so I would hang out on flickr all day. I came across these dolls and was immediately hooked! My first girl was a Frosty Frock, who I sent off to Frankie Darling for a custom. Not to long ago, I left Blythe for a while and have just recently jumped back into the Blythe world again. I always think “Blythe, I can’t quit you!’. My sister has a theory that people who customize Blythe dolls might have also ‘customized’ their toys when they were younger (with safety scissors and permanent markers), did you ever do anything like that when you were younger? That’s funny, I did mess with my Barbie’s when I was younger! I would always chop their hair off or add to their makeup. I guess it’s a natural thing for me to customize these adorable big headed girls! Fruit Punch custom by Jess. Photo credit: Jess/Milky Robot. For me, one of the most nerve wracking things I’ve ever done was put a melting hot glue stick onto a very expensive doll. 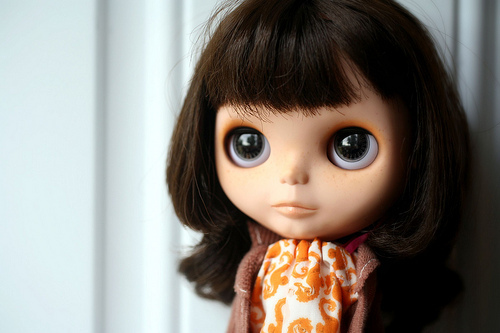 How did you get started with customizing Blythe dolls? 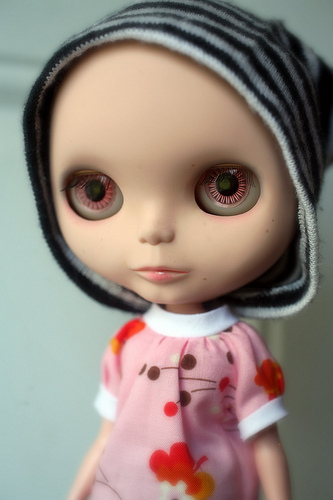 After getting my first Blythe customized, I kept pondering the idea of just trying it myself. I was a nervous wreck. Mostly cause I was so afraid I wouldn’t know how to put her back together after. The customizing part came easy for me since I was always into art and did a lot of painting in my younger years. I have to say, the glue sticks still scare me, but that’s cause I majorly burned three fingers one time pulling out eye chips. So now I’m a tad more cautious. Who was the first customized Blythe that you made and what was the most important thing you learned from that first experience? My first custom Blythe I did was on a CapChat. She was my second doll and I almost sent her out to be customized but decided to take the plunge myself. Everything from that custom was an experience, from how the doll functioned, to layering the colors just right. I learned a lot from that girl. Simply Mango custom by Jess (lovely eyechips to go with those freckles!). Photo credit: Jess/Milky Robot. What kind of mold bases do you like to work with the most? Why? My favorite mold to work with is EBL. I wish they were slightly easier to get open than an RBL, but I just love their faces. I tend to have a lot of fun when customizing them! I’m not sure exactly why I like them so much, but their cute faces win me over in a heart beat! For reroots, there’s a lot of different hair choices available. For you, what are the pros and cons to the different hair types? I’ve worked with Saran, Nylon, Alpaca, Mohair and even Polypropylene. My favorite to work with is Saran, or a Saran/Nylon blend. I notice I get little kinks once in a while when I work with just straight Nylon, so it gets a little irritating at times. Mohair and Alpaca are extremely soft and nice to use as well. I tend to make a mess with the two and have a hard time keeping it away from the cats, haha! Disco Boogie-Fancy Pansy custom by Jess. (I just love that doey-eyed look!) Photo credit: Jess/Milky Robot. 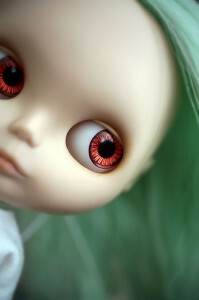 What is something that you know now that you wish you’d known when you first started customizing Blythe? Hmmm… Pastels! In the beginning, I thought chalk pastels were pretty much the same as far as brands go. I now know that some brands are just crap. Sometimes you need to splurge a little more on a good set than trying to save a buck. Not only does a nice pastel work better for me, but it helps me enjoy the process of customizing rather than cussing up a storm and having my cats run away from me. If you could describe your customizing style in 140 characters or less, how would you describe them? My style is a bit of a mix between natural and colorful. I tend to do natural lips with colorful eyes. I love to bring them to life! Lovely green gradient eyeshadow on the lids with glossy lips! Photo credit: Jess/Milky Robot. 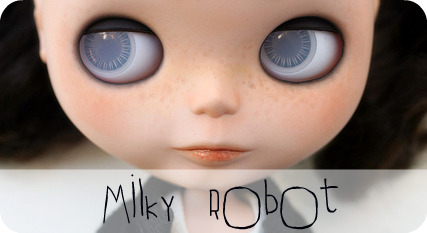 Where do you get your inspiration for the custom dolls that you do? Most of my inspiration comes from things around me. Graffiti plays a big inspiration in my book, I adore the colors and how the art is brought together. Some artists I admire are Shepherd Fairey, Miss Van, Mark Ryden and Jeff Soto. 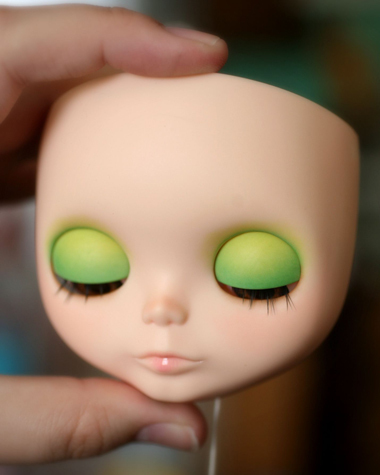 Do you have any special things that you always have to do before working on a custom Blythe? Make a list! I make a list of everything the customer wants done, from colors to freckles and chip placement. If they have a drawing I attach that to my list as well. The first thing I do before opening them up is check the doll out. I look for scuffs, cracks, check the eye mech, etc. I document this all so after I’m done working on a girl, I know what was there before I started. Heather Sky-Miss Sally Rice custom by Jess. Luscious lips, just complete love. Photo credit: Jess/Milky Robot. 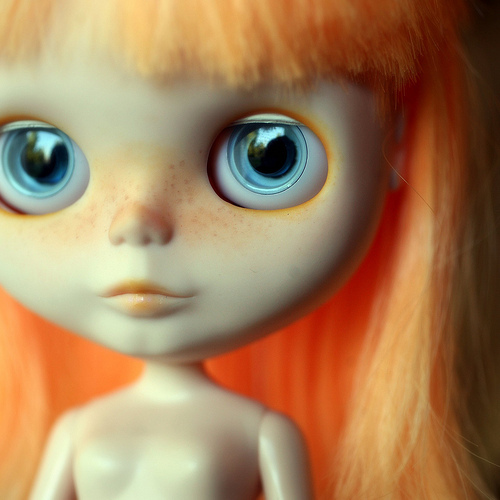 To you, what makes Blythe the perfect canvas for customization and artwork? Their faces are so much bigger than BJD’s and other dolls. They have a nice “flat” surface to work on, and more space to add to. Plus, they are adorable! What would you say makes your customs stand out from all the other custom work out there? I’m not exactly sure what stands out the most. I’ve heard my freckles are key point when picking out one of my custom girls. I like to think my natural touches make my girls stand out the most. Left: Simply Peppermint custom by Jess. Right: Love Mission custom by Jess (those EBL pink chips look fantastic with those natural looking freckles!). Photo credits: Jess/Milky Robot. I’d just like to say thank you for doing this interview with me, Jess! What kind advice would you give to someone who’s just entering into the Blythe hobby/community? Blythe will open you up to SO many new friends and experiences. When customizing your first girl, don’t be afraid! Get familiar with the forums, my favorite is Plastic Paradise. There are so many people in this hobby that will assist you in any way with your questions and invite you in with loving arms! Are you interested in getting interviewed and featured on BlytheLife.com? Check out all the reasons why you should consider getting featured and start the first step by letting me know about you on the how to get featured page. Yay! Thank you foe the interview, it was so much fun!! I love the way Jess does the doll lips, very cute! Do you know if she has a long wait list right now? I learn SO much from these interviews! Thank YOU!